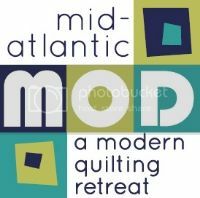 Philadelphia Modern Quilt Guild: Sewing Summit 2012! The school room was a beautiful creative space for us to sew in! Huge windows, large tables, extra lighting, a kitchen.. what else would you want? The day ran from 10am-5pm and consisted of two workshops, free sewing time and lunch. The first workshop was a color theory class by member/fabric designer/quilt pattern designer Jessica Levitt. Jessica brought stacks and stacks of fabrics (which I wanted to hide and take all of it home with me - that girl has a fantastic stash!) for us to play with. Jessica lectured, showed examples on a big screen and had us break into groups and do a number of hands-on activities with fabrics and paint chips. We were given stacks of fabrics and we were to sort them in value order - harder than it sounds! With the paint chips, we were to find all of the colors of the color wheel. It was fun! Great workshop!!!!! Paint chips are a handy tool when picking color combinations! How to use value and color saturation. We even had a couple Featherweights with their very own tables - very cool! The afternoon workshop was with Sujata Shah who taught a class on curved or "organic" piecing. Before she taught us her technique, she showed us a number of examples of quilts she had made. This was a technique workshop - no real pattern. Her sewing technique is something you need to see in person and definitely needs some practice! We finished the afternoon working on our curved piecing. You can see the gentle curves. Denise said she wants to make this larger and possibly use it as a background for some applique! All in all, it was a great day. We are all looking forward to our next guild sewing night! Thank you to everyone who helped make this day happen! It was a wonderful day! Thanks so much to those who helped organize it, those who taught us, those who fed us, and those who just had a great day! i agree! Huge thanks to everyone for such a great day! I'm getting ready to do some more curved piecing this weekend!